Pixar is in an almost no win situation. Every year when their new summer animation film comes out, we have unreasonably high expectations that they will once again strike gold. 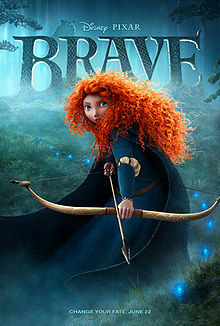 Those expectations were there for BRAVE, but unfortunately, it doesn't live up to the Pixar "standard" we're use to. It's strange because all the makings of an outstanding film is there. Scotland serves as a gorgeous background with many of the landscape shots as feast for the eyes. I have been lucky enough to have traveled there, and yes, it is just as breathtaking as the animation portrays. You have a young, fiery heroine, Merida, striving for her independence from her predestined place as the only princess of her Scottish kingdom. Mix in an overbearing mother, an aloof father, a witch and some magic, and yes, the set up seems a tad cliche, but if this studio can make an adventure with a crotchety old man be fascinating, surely they can make magic out of this? However, it all falls somewhat flat. There are some touching moments sprinkled throughout. The strongest points happen between Merida and her mother. Her mother sets up a Highland Games for suitors to compete for Merida's betrothal. Merida, of course, wants to decide her life for herself. It's never fully fleshed out what future she wants for herself. She is an accomplished archer, rides horses, and loves to explore. Maybe she wants to branch away from the kingdom and explore new lands? Does she want to fight in battle? She never really says, but she's absolutely positive she doesn't want to follow with what her mom expects of her. It very, very accurately depicts the push and pull many teenage girls and their mothers encounter. Switch the subject of a betrothal with college, boyfriend, major, or even a job, and you have a universal situation we've all experienced. Instead of calming talking through her feelings with her mom, Merida, like most rebellious teenagers, runs away and stumbles upon the local witch, who ends up giving her a potion to change her mom's "mind". At this point, the film does take a pretty unusual twist which I won't spoil. So, of course, Merida immediately regrets her decision and joins with her mother to try to beat the clock of the spell. Even though there are some flickers of the standard Pixar magic throughout the film, the plot ends up being very predictable and substandard. From learning about the initial conflict between Merida and her mother, you could almost close your eyes and probably accurately predict the rest of the film. It just didn't embody the uniqueness that we expect from a typical Pixar film. Also, Pixar has a knack for making films that almost feel more suited towards adults than children with deeper themes and jokes. Parents almost look forward to these annual films more than their children because they are that enjoyable. However, BRAVE's humor is a definite step down the totem pole. If you've seen any of the previews, you know the image of one of the older Scotsman mooning some other characters. Let's just say that's the tip of the iceberg for that type of humor within the film. It feels cheap and easy. It may feel that I'm completely ragging and hating on the film, but it's still enjoyable. I completely related to the mother and daughter struggle and got goosebumps from some of their interactions. One of Pixar's strengths has always been their depictions of relatable struggles from family dynamics in THE INCREDIBLES to the special relationship between a boy and a childhood toy in TOY STORY. However, BRAVE gets lost from all the other details from cheesy jokes to flat secondary characters that it loses any uniqueness it could have had. Between last year's CARS 2 and this, I guess Pixar has hit a low point.